The latest public release of Solid Framework SDK is now available for download from the developer portal at www.solidframework.net. This is version 10.0.8870. This is a Major Release. and includes a number of breaking changes. 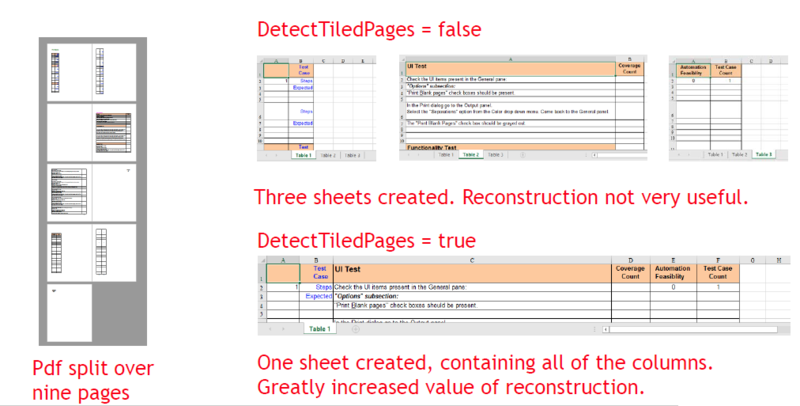 If a table within a spreadsheet is wider than the paper size then it will be created as a multi-page “tiled” PDF. Previously this would have resulted in the file being reconstructed with multiple tables. Solid Framework 10 is able to reconstruct these pages to give a single wide table. This functionality is enabled by default, but can be disabled by setting DetectTiledPages to false. Solid Framework has been able to reconstruct HTML for many years. This has been done by “reflowing” the document which results in a web page that may be easy to read, but that may not look like the original PDF. Solid Framework 10 now allows HTML to be created that looks very similar to the PDF by setting ExactMode to true. Some PDFs with complex layers were not being reconstructed correctly. Solid Framework 10 now handles these files better. Improvements have been made in being more consistent with font types and styles to provide a more aesthetic document. A number of PDF files that could not previously be converted due to errors can now be corrected and a valid document reconstructed from them. License.Import now throws InvalidLicenseException immediately for invalid licenses, rather than delaying the error until conversion is attempted. This could result in slightly different behaviour than was previously the case.